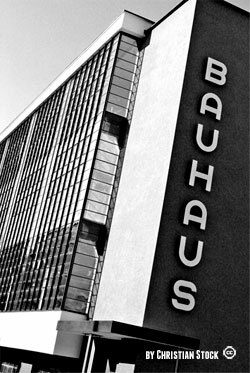 The Bauhaus was a school which operated in Germany between 1919 and 1933 and was devoted to art, architecture and design. It had remarkable influences on all these disciplines. Although throughout it’s years it carried varied approaches, some ideas were maintained. One main principle is the reunion of the arts and the crafts in order to achieve total works of art. According to this principle, all arts, as well as new technologies, should be combined in the art of building. Six Israeli architects studied in the Bauhaus school: Shlomo Bernstein, Munio Gitai (Weinraub), Edgar Hed (Hecht), Shmuel Mestechkin, Chanan Frenkel and Arieh Sharon. A seventh architect, Philip Hütt, probably also attended courses at the Bauhaus school in Weimar. However, the influence of the Bauhaus on the architecture built in Israel in the 20’s, 30’s and 40’s was by far wider than just by those architects only. 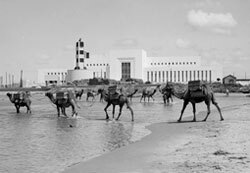 Bauhaus Center Tel Aviv was established in 2000 by Dr. Asher Ben-Shmuel, Shlomit Gross and Dr. Micha Gross. Its goal is to expand public recognition of the “White City” as a unique architectural and cultural site. To achieve this, the center holds a gallery with a permanent collection and changing exhibitions, conducts tours of the city and is a publishing dedicated to the subject. The center cooperates with the Israeli Committee for UNESCO and the municipality of Tel Aviv-Yafo as well as with various institutions, museums and galleries. The best way to understand the virtues of Tel Aviv’s unparalleled architecture and urban landscape is through our concise guided tour. The center, together with the Israeli National Committee for UNESCO, offers the most professional tours, given by expert guides and licensed by the Ministry of Tourism. Over 15,000 people have taken our tours over the last 10 years! Our tours are offered at various times and numerous languages and are continuously fully booked. If you want to stay spontaneous or can’t make it for one of our guided tours, we provide audio guides in various languages and accompanied by videos and maps. The Bauhaus Center White City Tour starts every Friday at 10:00 at the center. Our center includes a gallery hosting changing exhibitions about Bauhaus architecture and design, the city of Tel Aviv and contemporary art, design and architecture. The center’s shop includes a bookstore and a designers boutique. The bookstore focuses on Bauhaus history and legacy, the city of Tel Aviv, design and architecture. The boutique offers original Bauhaus items as well as contemporary Israeli design. If you are not visiting Tel Aviv in the near future, some of the items are offered in our online store. Special Discount for Docomomo International Members! Our center in also a publishing house in its areas of expertise: Bauhaus, Tel Aviv, architecture and design. If you are an author in these fields or a book distributor, please email us and we shall respond shortly.